What a wretched time of year! At our house, we’re sick of hearing weathermen’s false promises about inches of snow and receiving only rain and mud. We’re tired of looking at bare trees with no leaves – and we’re starting to get itchy for crabs. It doesn’t help that we still have months to wait before Maryland crustaceans are back in business. For a respite from our seasonal doldrums, we cruised to Annapolis for restaurant week. We’re currently updating our Maryland book, so we wanted to investigate some new places. Despite the cold temps and occasional snow flurries, the town was bustling with hungry people eager to taste the best bites in Annapolis. We were hoping to discover a little crab at this historic port, even in the off-season. Our first stop, The Boatyard in Eastport, was packed, but we found two seats at the bar. Bill ordered a dozen raw oysters, and I requested another dozen fried. I was busy listening to a boater’s animated explanation of the town’s annual ritual of roasting oysters and burning old socks in a bonfire to get geared up for flip-flop season, when Bill nudged my arm. He uttered a sentence I never expected to hear from Bill’s lips, “A man in a hotdog suit just walked into the bar.” I half-expected him to be followed by a priest and a rabbi, living out the off-color jokes my dad used to tell. Instead, four more wieners with mustard trails swirled down their chests sauntered through the door. Before my eyes, five cheerful franks were lined up politely asking the bartender for a cold brew. Hotdogs and beer make sense at a summer Orioles game but in winter at an oyster bar? What gives? Grabbing my camera, I approached the Frankfurter Five and started taking photos. Were they promoting a new brand of sausage? Helping a local charity? Or maybe trying to lure customers to another restaurant nearby? Nope. They were just a bunch of guys hitting the town on a dreary Saturday. 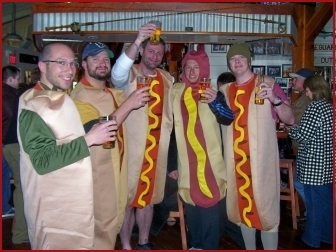 They didn’t deny that they were offered more free beer than usual thanks to their hotdog and bun attire. One can only imagine how much better they’d scored if they’d chosen to wear crab outfits. We followed the merry sausage brigade into the streets for a while, but soon realized that the off-season didn’t afford much opportunity for local crabs. So, we headed north of town in search of something more tropical and perhaps a little tiki. 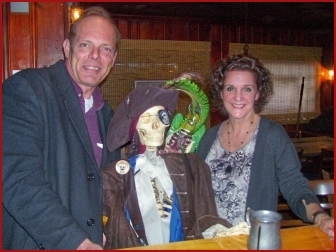 Rumor had it that a new place called Mutiny just opened in Glen Burnie, and pirates had infested the joint. Other than a parrot and a sword on its sign, we didn’t see much evidence for a tiki experience outside the bar, located in a middle-class neighborhood and surrounded by suburban homes. Rum barrels on the deck lifted our spirits. Once inside the dimly lit tavern, we walked the plank and plunged into an island world where scallywags roam and sea wenches with tattooed arms sling drinks to thirsty travelers. The bartender greeted us with a crooked grin. A lusty “aargh” seemed like the appropriate reply. Maps of Caribbean trade routes covered the walls, bamboo blinds hung above rattan furniture, lights made of bloated pufferfish floated above the bar, and wooden barrels served as tables. Aargh, indeed. We’d landed in a place that boasted 140 different types of rum and a passport club to test them all. Once he came into focus, I realized that the gentleman cozied up on a bar stool had no skin or flesh, only bones. He donned a dapper hat with a chartreuse plume, and his skeletal hand firmly gripped a pewter mug of grog. The perfect companion for a long cross-country flight or an evening when you don’t want to be disturbed. His steely grin assured us that winter would soon be over and a warm breeze would return to the Bay. And before long we’d be back on a sunny trail, discovering new places to cure our crab withdrawal and share a sip of tiki.